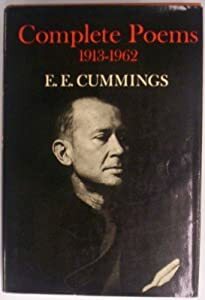 As I was leaving Michigan thirty-nine years and one month ago, I gave myself the gift of a book: Complete Poems, 1913-1962, E. E. Cummings. It was totally impractical. I boarded the plane to begin again in San Francisco with only two suitcases, but one of them contained the 866-page hardcover book of poetry. Very few things from that time in my life are still in my possession. So it’s safe to say this book with the yellow pages, numerous scrap paper bookmarks (one with the words “grass” and “picnic,” another with directions to someplace in Marin County, and a third with a woman’s name in red crayon, a phone number, and “day after Easter”), the torn cover, and multicolored Post-it flags has stood the test of time. No, I didn’t know you had (have?) a copy of that book. Cool! Yes, those words struck me, too, when I reread the poem.